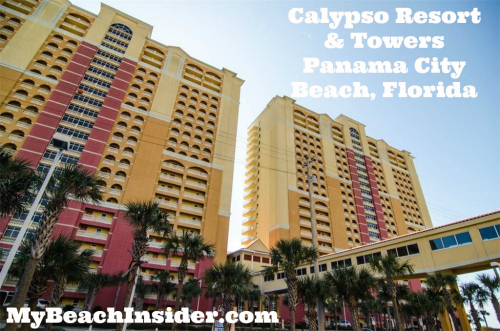 Calypso Resort & Towers is a beach front condominium in Panama City Beach, Florida. It consists of two towers, Tower 1 (I) and Tower 2 (II). Each tower has 23 floors and 9 units on each of those floors. Tower 1 is the eastern tower and tower 2 is the western tower. There are six different floor plans to choose from at Calypso. 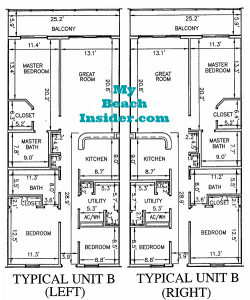 Some of the layouts are very similar and there are two versions of most floor plans because they are mirrored depending on which building they are in or where they are located within a building. See the descriptions below on the individual floor plans for more details. Unit C is a one bedroom/one and a half bathroom floor plan in both Tower 1 and Tower 2 of Calypso Towers. It can be found in units that end in 05 in each building and is 942 sq ft. The following description is for the unit in Tower 2 of Calypso Resort. Tower 1’s version of this floor plan is exactly the same except for the fact it is mirrored. These units are right outside of the elevator lobby. As you enter the unit a half bath will be on your left and the utility room will be on your right. 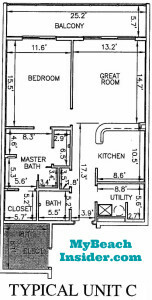 As you continue into the unit, there will be a closet on your left and the kitchen will be on your right. The unit then opens up into the great room/dining room combination. There is a sliding glass door that leads to the balcony straight ahead. 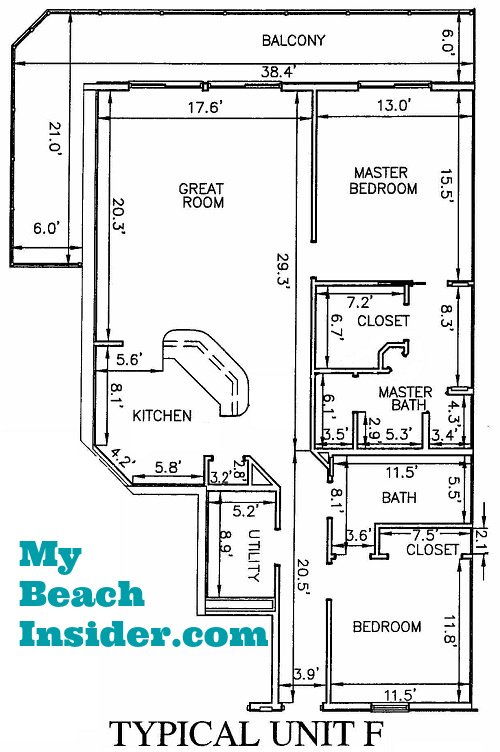 There is also a door to the gulf front master bedroom on the left wall. The breakfast bar separates the kitchen and great room. As you enter the gulf front master bedroom, you’ll notice a sliding glass door that leads to the balcony to your right and a master bathroom on your left. The bathroom has his and her sinks as well as a separate shower and tub. The master bedroom has a small walk-in closet as well. 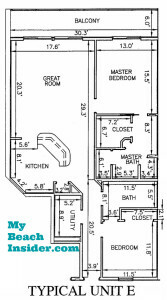 Unit D is a one bedroom/two bathroom with bunk area floor plan. It has two versions, left and right, that mirror each other exactly. These units are 945 sq ft. The left version can be found in units that end in 03 and the right version can be found in units that end in 07 in both Tower 1 and Tower 2 at Calypso. 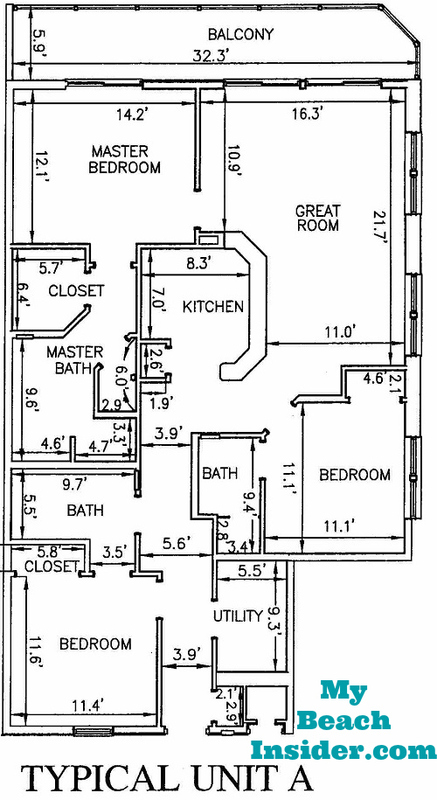 When you enter the left version of this floor plan, the bedroom will be on your left on a diagonal wall. To your right is a washer/dryer closet. The bedroom has a closet and access to a private bathroom with one sink. As you continue down the hallway, the bunk area will be on your right and the second bathroom will be on your left. 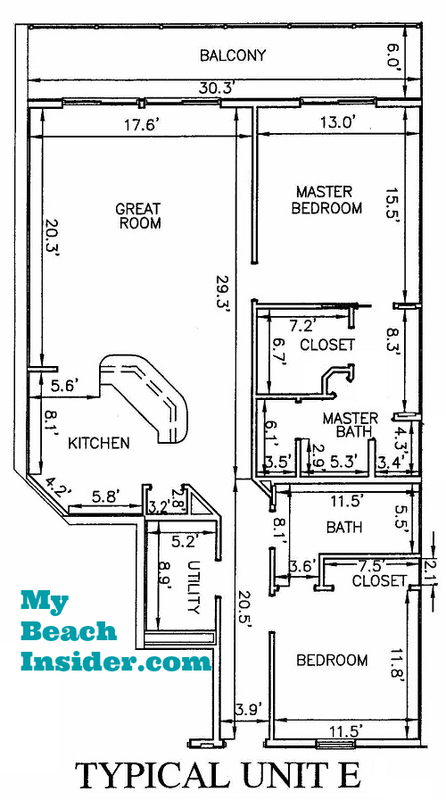 Just a bit further ahead, you’ll find a utility closet on your right and the kitchen on your left. The unit then opens up into the great room/dining room combination. There is access to your balcony through a sliding glass door on the far wall. The kitchen has seating at a breakfast bar that separates the kitchen and great room. There is a small closet on the right side of the unit with a door on the south wall just past the utility closet. The right version of this floor plan is exactly the same as the left version except for the fact that it is mirrored. 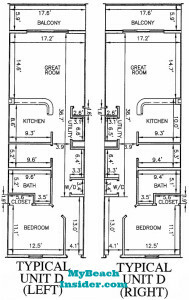 There are two different two bedroom/two bathroom floor plans in each Tower of Calypso Towers, but they are very similar. The only difference between the two floor plans is the balcony. 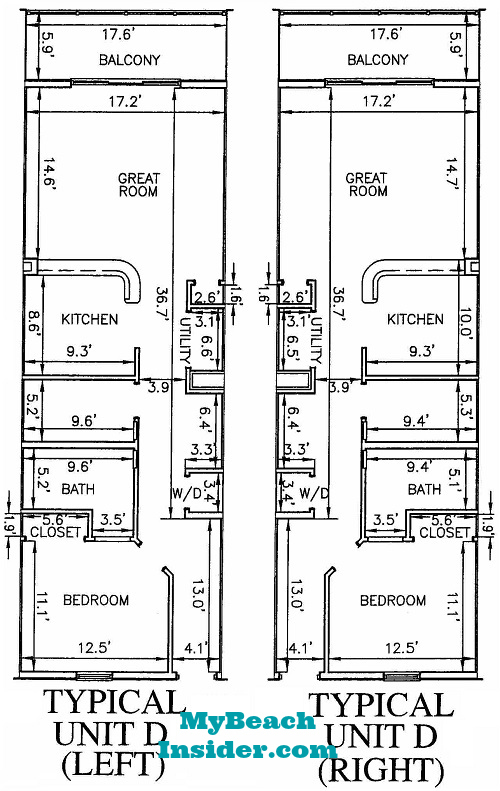 These floor plans can be found in units that end in 09 in Tower 1 of Calypso and in units that end in 01 in Tower 2. They are 1,629 sq ft.
On floors 1 through 6 this unit is called Unit E and the balcony extends the whole width of the unit. On floors 7 through 23 this unit is called Unit F and the balcony wraps around the corner and extends along the side of the building for an additional 15 feet of balcony space. See the images for details. The description below is of the Tower 2 version of the floor plan. The Tower 1 version of this floor plan is exactly the same except for the fact that it is mirrored. As you enter these floor plans, you’ll come across the first bedroom on your right. This bedroom has a standard closet and access to a bathroom that is shared with the rest of the unit. As you continue down the hallway, you’ll come across the utility closet on your left and the shared bathroom on your right. As you walk further into the unit it opens up into the kitchen on your left and the great room/dining room combo straight ahead. There is a small closet/pantry on your left as you enter the kitchen from the hallway. The kitchen can be accessed from either the hallway or the great room. It has an island with seating for a dine in feel. Straight ahead, in the great room, are two sets of sliding glass doors that lead to the balcony. There are also two windows on the wall to your left which face east in Tower 2 or west in Tower 1. On the right wall in the great room is the door to the gulf front master bedroom. The master bedroom has a sliding glass door that leads out to the balcony and it also has a private master bathroom. The master bathroom has a walk-in closet, a separate bath and shower as well as his and her sinks. That’s not all! The master bathroom has a small linen closet and a water closet. 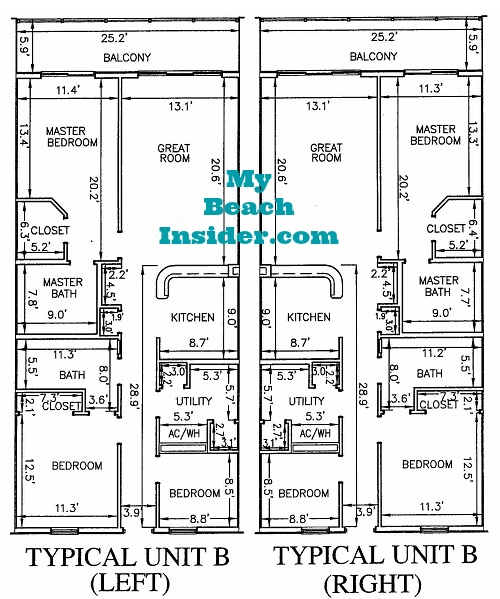 Unit B is a two bedroom/two bathroom floor plan with a bunk room. There are two versions of this floor plan, left and right, that exactly mirror each other. The left version can be found in units that end in 02 and 04 in both Tower 1 and Tower 2 of Calypso Resort. The right version can be found in units that end in 06 and 08 in both Tower 1 and Tower 2 of Calypso Towers. 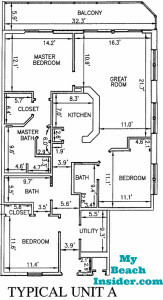 These floor plans are 1,372 sq ft. 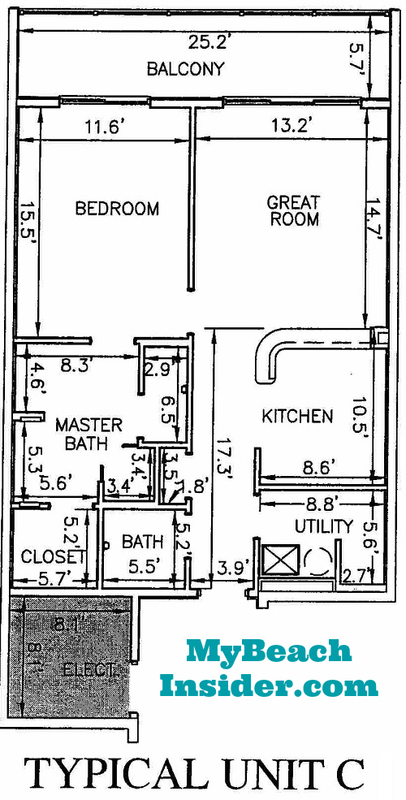 When you enter the left version of this floor plan, the first room you’ll come to is the bunk room on your right. A little further down the hallway, the first bedroom will be on your left. It has a standard closet an access to a bathroom with one sink that is shared with the rest of the unit through a separate hallway entrance. As you continue down the main hallway, you’ll find a utility room on your right and the hallway bathroom entrance on your left. Just past the utility room you’ll find the kitchen, also on your right. Across from the kitchen, on your left, is a closet and a wet bar area with a small sink. Past the kitchen, the unit opens up into the great room/dining room area. There is a sliding glass door on the far wall that leads out to the gulf front balcony. A breakfast bar area separates the kitchen and great room. As soon as you enter the dining room/great room combo, there is a door on the left wall that leads to the gulf front master bedroom. The gulf front master bedroom features a sliding glass door to the balcony, a walk in closet and a private master bathroom. The master bathroom has his and her sinks. The right version of this floor plan is identical to the left version except for the fact it is mirrored. There is one three bedroom/three bathroom floor plan available in Calypso Towers and it is called Unit A. It can be found in units that end in 01 in Tower 1 units that end in 09 in Tower 2. These layouts are 1,583 sq ft. It is on the eastern end of the building in Tower 1 and the western end of the building in Tower 2. The description of the floor plan below is the Tower 2 version. The Tower 1 version is an exact mirror copy. As you enter the unit, there is a closet immediately on your right. Further down the hall, there is a utility room on your right. Across from the utility room, on the left side of the condo, is the first bedroom. This bedroom has a regular closet and an entrance to a bathroom that is shared with the unit. Further down the main hallway, the hall entrance to the first bathroom is on your left. The unit then opens up into the kitchen, which is straight ahead. To your right, you’ll see a door to the second bedroom, which has it’s own private bathroom. Continue around the kitchen breakfast bar area and you’ll enter the combined great room/dining room area. There is a sliding glass door that leads out to the balcony. 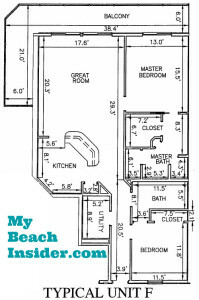 On the left side of the unit in the great room you’ll see a door leading to the gulf front master bedroom. This bedroom has a sliding glass door that leads out to the balcony. The master bathroom features a walk-in closet, a water closet, dual sinks and a separate shower and tub. Planning On Vacationing In Panama City Beach? Learn More! If you’re planning on taking a vacation to Panama City Beach, then you should definitely be prepared! Learn everything that only an insider, or local, would know! I’m a Panama City Beach area local and share everything I know here on MyBeachInsider.com. Take a look around!